Sometimes a deposit entry get flubbed and the best way to fix it is to just undo the entire deposit and start from scratch doing it right the first time. Previously this process was not very intuitive and involved individually modifying each transaction. Now it’s much easier. When you are viewing your deposit you’ll now see a link labelled [undo]. Clicking this link will open up a confirmation window and when you click Undo Deposit, all the funds are removed from the deposit and placed back into your Undeposited Funds account where you can then re-do your deposit correctly. Not currently using Rentec to manage your deposits? It can save a lot of time and keep your records straight. 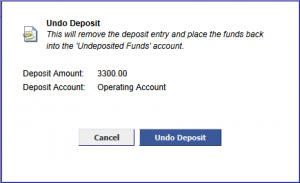 See our original feature post on undeposited funds and deposit support.